Leaving the Harbour Towne Marina was so exhillerating! We untied from the dock and navigated through the waterways, making our way closer to open water, and as the minutes passed more and more crew on the boat woke up and gathered on the bow to watch. We were all so excited, but none of us showed the excitement as much as Jude!! She just couldn’t contain herself!! 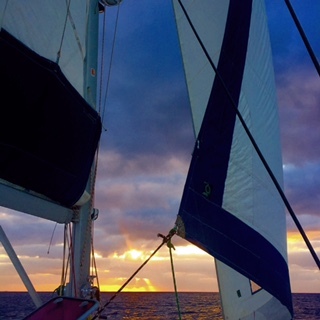 Finally we reached the last of the red and green markers and turned to starboard, headed in a south east direction to Gun Key, Bahamas. 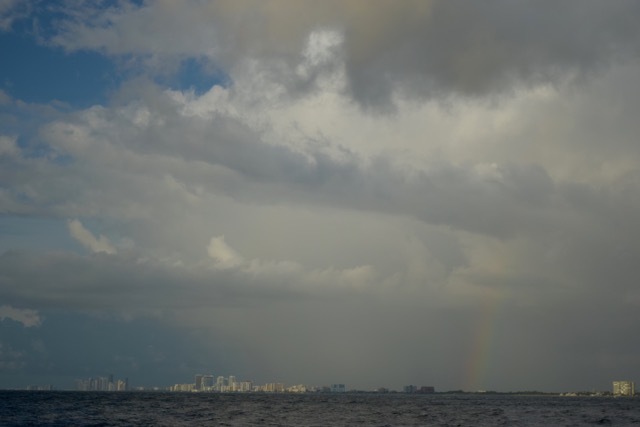 A small rainbow marked it’s stamp of joy and approval in the sky just above Fort Lauderdale, as the wind and current hit us right on our nose. Marci decided she didn’t like the way the Bonine (motion sickness medication) made her feel – she was groggy all day and would have done fine without it. Everyone was so relaxed and happy that there were bodies taking naps sprawled all over all day long. Chad and the boys set the fishing lines and caught a small Cero at one point, and set him free to grow some more, Jude wandered around and helped at the helm and kept exclaiming how happy she was! 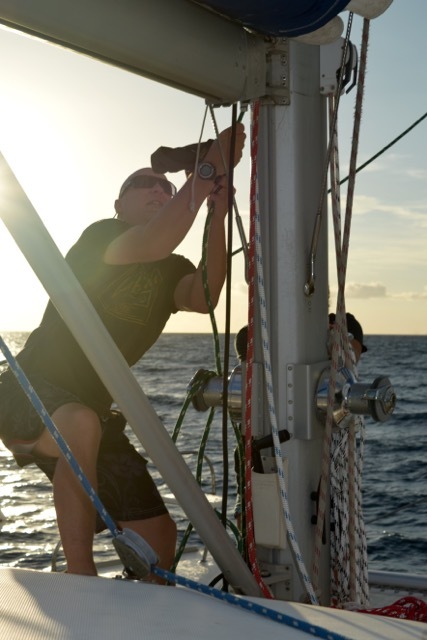 We raised the main (Chad did a god job raising it manually as far as he could) but were headed into the wind, and a couple times tried the jib, which looks so great after the work they did on it, but for the most part just relied on the engines. After about 10 hours we yelled Land Ho, as Bimini, Cat Cay and Gun Key lay across the horizon, and a US Coast Guard boat slowly made its way back and forth, patrolling the area. Since the windlass is out of commission, Chad, Jude, Aidan and Emma prepped the anchor chain and when we were ready, used their muscle to set it. Our new 88 lb Rochna anchor bit into the sand and held Tanda Malaika tight, and Mycah came barreling from stern to bow and launched herself off into the water. Before we knew it, everyone forgot that it was dinner time and we were all immersed in the coolness of the ocean. While swimming around we saw several nurse sharks, one of which had 3 hooks in its mouth. Poor thing. We also saw several sting rays and all sorts of reef fish. It felt SO GOOD for us mermaids/mermen to finally be back in the water. Even as I write right now, a Spotted Eagle Ray is gliding around off the starboard side below me. We enjoyed a big Taco Salad and Key Lime Pie for dinner in the stern salon and I got to talk to my love, who landed safely in Taipei. I worry about him going to France but he keeps reassuring me that he will be fine. 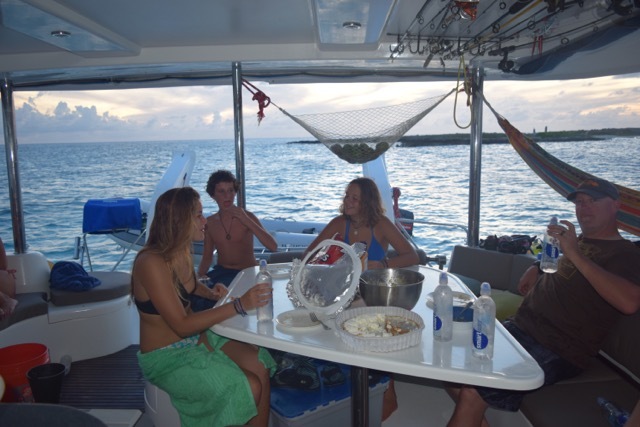 It wasn’t long after some of the crew played ‘spoons’ that everyone was sound asleep in their berths, gently being rocked by the beautiful Bahamian water. A new adventure begins….